Newly elected State Representative Greg Markkanen is eager to get to work on the issues he says were most important to the people who sent him to Lansing. 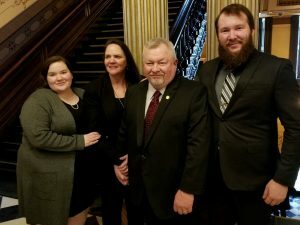 The Hancock Republican was sworn in last week to the 110th District and then spent the day with his wife and children in the state capitol. But when the legislature reconvenes, Markkanen says they have a lot of work to do. Other issues include education, moving the economy forward, and keeping unemployment low, but first thing’s first–getting the insurance reform passed. Markkanen has been appointed to the Education Committee, Energy Committee, Military Veterans and Homeland Security Committee, and he is the Majority Vice Chair of the Insurance Committee. The State House is in recession until Tuesday, January 22nd.